About - leapfroghigh, way up there! 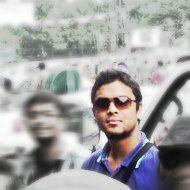 Hi there, I am Saad (nick- leapfroghigh) from Bangladesh, and I am a Professional Freelance Service Provider. My area of expertise is Graphic Design; both Web and Print designs. Graphic Design used to be my hobby only, but now in fact I have transformed it into a successful and profitable profession. So, I am here to share some of my experience with you about freelance work that you can easily do from Bangladesh. Now let me start with how I got into all these; trust me I’ll make it brief and not bore you to death. Well, from a very early time I loved drawing; from basic landscapes to typography. Then my beloved parents (they’re wonderful people) introduced me to few digital imaging softwares like the Ulead PhotoImpact and then later Photoshop. I enjoyed the digital drawing very much. But back then I kept it entirely to myself, didn’t really have any exposure and thus it remained “only” a hobby. Few years back I learned about the existence of the global freelance market and it made me a little curious. I peaked into few of the popular sites and even became a member in one of them. Please excuse me for skipping the name of the site, trust me I have good reasons (e.g. it wasn’t good and it’s a bad memory). Anyways, after experimenting around for some time I found that some of the sites had potential. One of the major challenges for me was to cope with the idea of global competition, the work wasn’t some random social activity; it was real people with real work and real money. Another major concern for me was to find a way to receive the payments for the work that I was doing. Services such as Paypal do not work here in Bangladesh, so I needed to find a way to make this work. Eventually I figured out the solution to that. And like that, through difficult hurdles and tough times, now I can finally do the freelance work in peace. Hope you like my work, and hope I can help you to earn a few extra bucks through freelance work from Bangladesh. Do drop a line/share your thoughts and I’ll try to get back to you as early as possible.